But I do not understand how we can multiply a signal $x(t)$ with the delta function $\delta(t)$, as the $\delta(t)$ is infinite at $x=0$. So this multiplication would amount to multiply a real-valued function with $\infty$ which is obviously not what is meant here. I think. So would it make the formula formally correct if we would swap the $\delta(t)$ with the indicator function? because we simply define $x[n] \triangleq x(nT_s)$. the difference between the dirac delta and the indicator function is that one integrates to an area of 1 and the other integrates to an area of 0.
which is true as long as $x(t)$ is continuous at $t=nT$. Consequently, multiplying a signal with a Dirac impulse train results in a weighted impulse train, where the weights are the signal values at the sample instants. 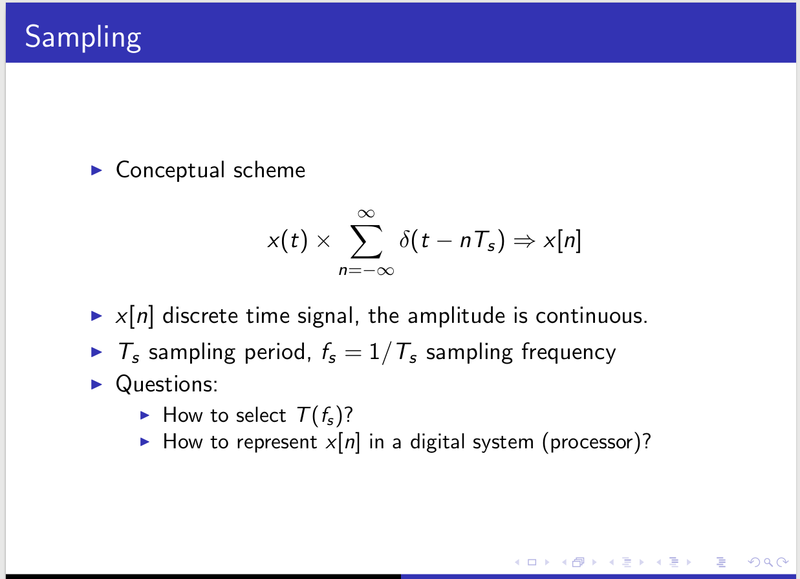 So what happens is that from a continuous signal $x(t)$ you only retain the sample values $x(nT)$, but you still have an expression that can be considered a continuous-time signal (in the sense that it can be integrated or convolved with another function). which is now an ordinary function which can be evaluated for any $t$. In addition to the other answers, I would also like to point out that the "ideal" impulse sampler is usually considered to be followed by some filter of some kind, such as a zero-order hold. The infinite-amplitude spikes are "averaged out" by convolving with the filter impulse response. Also, even without any filtering after the impulse sampling, the spectrum of the sampled signal creates a mathematical model for the aliased spectrum that is mathematically equivalent (up to a constant) with the periodic spectrum computed using the discrete-time Fourier transform (DTFT). Can an Delta Dirac function (not response) ever be sampled?